It is an incontestable universal fact that no nation can survive, leave alone progress, without the resourceful outputs of its armed forces. Be it in the field of battle facing the invading aggressor or using its disciplined and organized manmanagement machinery to overcome the effects of natural or man-made disasters or at times of extreme situations of lawlessness. Yes, the armed forces, are deemed as the ultimate saviour anywhere at any given time. We, in India, have been a witness to this remarkable phenomenon right from 1947. During the Partition, millions of men, woman and children were saved and brought to safety by relentless efforts of the truncated armed forces on both sides of the border. Then we saw how the three services, the Army, Navy and the Air Force came into action, not only during the various wars the nation faced with China and Pakistan, but also during various natural calamities, like devastating floods in Assam, Bihar, Uttar Pradesh, Rajasthan, Andhra Pradesh and Nepal or the terrible earthquakes that had rocked Latur in 1990, Bhuj in 2000 and Uttarakhand in 1991. The theaters where the army has won laurels range from insurgency and related hiccups in the north-eastern states to terrorism in Jammu & Kashmir. The Forces have not only facilitated safe governance but also gave a boost to socio-economic activities winning the hearts and minds of the people. 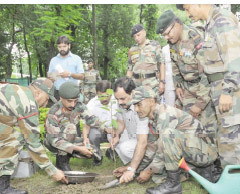 "Clean Ganga" campaign can benefit from the expertise of Army's Eco Task Force. Its manpower is motivated, and disciplined; they are trained in planning and timely execution of a job. 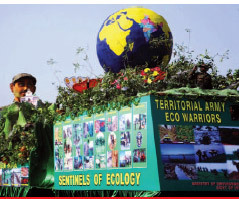 Army's Eco – Task Force, set up in 1970s, has given a fresh lease to the green cover along the hill slopes in Garhwal and Kumaon. 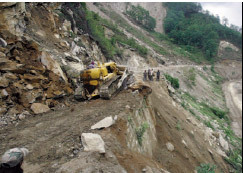 The Border Road Task Force(BRTF) is opening up the rugged mountain ranges for military as also civilian traffic. On the maintenance of law and order and providing good governance, the armed forces, particularly the Army, have come out with flying colours. During the 1961 communal riots in Jabalpur, Prime Minister Jawaharlal Nehru visited the city and thanked the Army for "its wonderful job of ushering in peace" there. During the anti-Sikh riots (1984), the sensitive central district of Delhi had an Army Major as its Deputy Commissioner of Police (DCP). When the Barapulla Bridge under construction fell with just two days to go for the prestigious Commonwealth Games (2010), the Army engineers had stepped in and saved the day for the country. 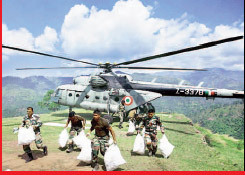 All this goes to prove one thing: the Armed Forces perform beyond their allotted role – defence of the border. 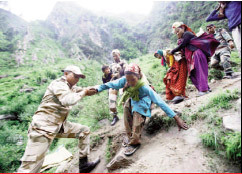 Why are the jawans so much in demand in practically every situation of failure of the governing system? What are the qualities that a person from the armed forces has so different from civilians? A,rmed forces believe in Planning Leadership. For them, what matters most is Command, Control and Coordination Communication, Delegation, and Management by objective. Also relevant, equally, are Key Result Area, Key Result Function,Motivation, Morale, and Operational Research. This is true of the armed forces all over the world. Another perfect management practice in Army is PERT (Programme Evaluation Review Technique), a methodology developed by the U.S. Navy in the 1950s to manage the Polaris submarine missile programme The concept of Operational Research was developed during the Great Berlin Air Lift after the Second World War. How can we, in India, utilize the resourcefulness of the forces to strengthen the governing system for the benefit of the entire nation? It is time we have a nation-wide debate on this engrossing subject. The top decision making levels of the executive must deliberate it. And a national policy should be evolved about using the vast capabilities of the armed forces to run projects which are victims of inefficiency, lack of coordination, lack of planning and so on. My take on where the armed forces can help. 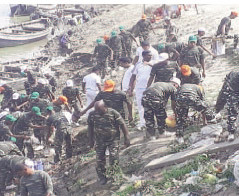 "Clean Ganga" campaign can benefit from the expertise of Army's Eco Task Force. Its manpower is motivated, and disciplined; they are trained in planning and timely execution of a job. Take the case of the Lake in Bangalore, our very own Silicon Valley. The problem here is inflow of pollutants. One company of Army engineers with proper technical guidance can easily execute this task. It is upsetting and,indeed,shocking to see millions of tons of food grains (wheat,rice,pulses and vegetables) lying in the open rotting in rain and heat even as we witness a shortage syndrome and millions of poor are suffering hunger. 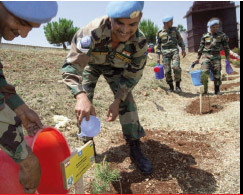 The Army has a very efficient section, called the Army Service Corps (ASC). ASC has honed its skills in procurement, storing, and transportation by road, rail and air. Its para drops ensure that supplies reach the most remote and inaccessible regions of forces deployment through sunshine, shower and snow. Every citizen must have the attributes and qualities of a soldier. 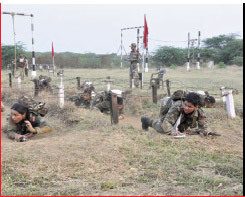 This can be done if compulsory military training is imparted in every school and college. The nation would have a vast stock of soldier-citizens ready to face its challenges. Farms. It used to run in all 39 Military Farms with about 25000 cattle to meet the requirement of milk and butter. This body must not only be revived but be refurbished to meet our much higher demands. Our vast borders with China are in dire need of rail tracks and rail communication system. Here the Rail TA system must be put to use in conjunction with the personnel of Army Engineers. 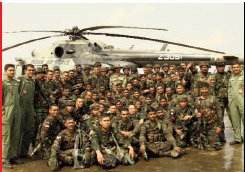 Not only the Army, which can play a crucial role in the field of national development, the Air Force and the Navy, too, would have to contribute in various fields and processes. The Auxiliary Air Force, which was a part of IAF, played a very crucial role at one time as supportive element or second line of defense to the Air Force. It can be revived. Its air and ground crew were primarily employed in various other civilian professions, but were available wherever IAF needed them. A number of civil luminaries were a part of this force. However by the mid- seventies, this force was disbanded with the trained crew absorbed by the mother body in most of the case. For instance, Neel Batra, a famous commentator on All India Radio, was a fighter pilot with the Auxiliary Air Force. He returned to I&B Ministry after his tenure with the Auxiliary Air Force. India has a large number of abandoned war-time air fields, especially in West Bengal, Orissa, Jharkhand, and Chhattisgarh. Between Kolkata and Ranchi alone, there are over 40 such air fields like Chakulia, Salboni Chaibasa, Dudhkundi, and Pannagarh. These airfields should be made functional again. The role of New Auxiliary Air Force could be manifold in the field of internal security helping the para military force to the security of the vast rail track through various monitoring and patrolling systems such as the Microlites,UAVs, Balloonsand even satellites. When the word military is mentioned, a civil mind gets agitated --- "Is my liberty being put at stake ? Am I being bound to undemocratic methods and practices?" Unfortunately, we have conditioned our minds to think that the uniformed soldier is a complete opposite of what is required to support a democratic machine. We hardly care to know the sacrifices of liberties and rights a soldier makes to make us live freely and safely as a democratic nation. Every citizen must have the attributes and qualities of a soldier who guards the nation. This would make the citizens physically fit and fully motivated with right qualities of leadership and managerial traits. This can be done in a unified and systematic manner if compulsory military training is imparted to each and every school and college student. The nation would have a vast stock of soldier-citizens ready to face the challenges to the nations. In the late sixties when NCC was compulsory in schools and colleges, NCC cadets contributed immensely. During the 1962 and 1965 wars, they acted as escorts to Military Logistic Trains and convoys of civil truck carrying military equipment. As refugee columns moved, the NCC cadets helped the local police. The nation will stand to benefit if the NCC gets broad-based and strengthened across the country and becomes the Young India Military Corps. (IDS). 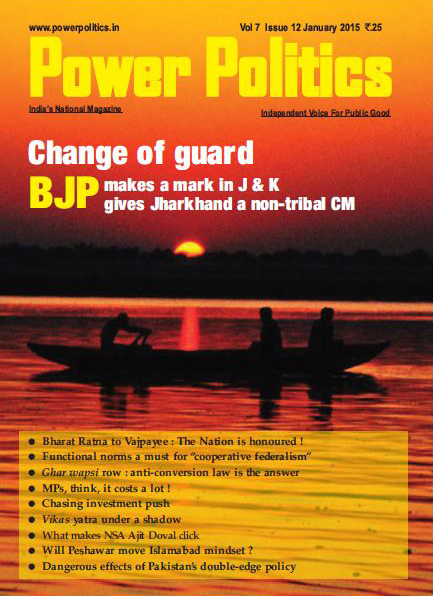 Officers and men could be drawn from the three services as also from BSF and ITBP on deputation. The state level YIMC could be headed by a Maj Gen or equivalent rank officer with a mandate to control district-level areas through YIMC Battalions. It should be appreciated that compulsory military training would hold good if the student has a fair understanding of national security, role of armed forces, development and requirement of modern weapon system, dependence of military on national Industry and disaster management. YIMC must be started at the 8th class and continue till the college level. The syllabus can be jointly worked out by a team of service officers and officers from the Ministry of Education. Internal security, threat from various quarters, Naxalism and subjects like indigenization of defenserelated industries should form the core of the syllabus. Military training - ground, sea and air, could be the responsibility of the service groups. A special committee formed by officers of the defense services, education ministry and UGC can identify and prepare additional syllabus subject matters that have a bearing on national security. No cadet of YIMC should be allowed to be part of any political activity. Well, they will be free to consider politics after leaving college. Across every state, YIMC camps should be held taking the help of service formations. For cadets of the class X11 and college, the camp should be common at one place. The foregoing needs adequate financial resources. The defense budget must be suitably upgraded. The Human Resource Development Ministry at the Centre and in the States must chip in monetarily, and logistics-wise. In the longer run, the organization of Home Guards could become a part of the new venture to give it an added punch. This vast reservoir of capable national manpower would not only become the second line of defence, but also contribute to nation-building, governance, law and order and regional security. The author is a leading strategic expert. He has been a Wing Commander in the Indian Air Force.